Mourning ceremony for a Hero of Russia Alexander Prokhorenko, an officer of Russia's special force, who was killed in Syria last March 17 while performing a combat assignment. The ceremony takes place on the Chkalovsky aerodrome before the body's shipment to the Orenburg Region, the birthplace of Alexander Prokhorenko. Negotiations with terrorists about the body of Hero of the Russian Federation Alexander Prokhorenko, who died in March near Palmyra, went on for a month after his death. One of the participants says that the Islamists "put forward many demands" before handing over the remains of the Russian officer, who was killed in action while identifying ISIS targets. Four days after Russian Special Operations Forces (Spetsnaz) Officer Alexander Prokhorenko died near Palmyra in March 2016, the Russian Defense Ministry sent a letter to the leadership of the Syrian Kurdish People's Protection Units (Yekîneyên Parastina Gel, YPG), said a source who was directly involved in this operation. In the letter the Russian military asked the Kurds to help obtain Prokhorenko's body, which had been taken by ISIS militants. "A special group from the Russian forces was appointed to negotiate with ISIS. Since the matter concerned the return of the body of a Russian officer, the Islamists put forward many demands," said a Kurdish participant in the negotiations, speaking on condition of anonymity. Senior Lieutenant Alexander Prokhorenko died on March 17, 2016 at the age of 25. He was an outstanding specialist in identifying targets for Russia’s bomber squadrons and was located in the Tadmor settlement (Palmyra, Homs Province) in Syria. At the time Prokhorenko had been present near Palmyra for about a week and was responsible for directing Russian aviation at ISIS positions. According to the Ministry of Defense, when the militants discovered the young officer, Prokhorenko, not wanting to surrender, ordered an airstrike on himself and died along with the surrounding terrorists. 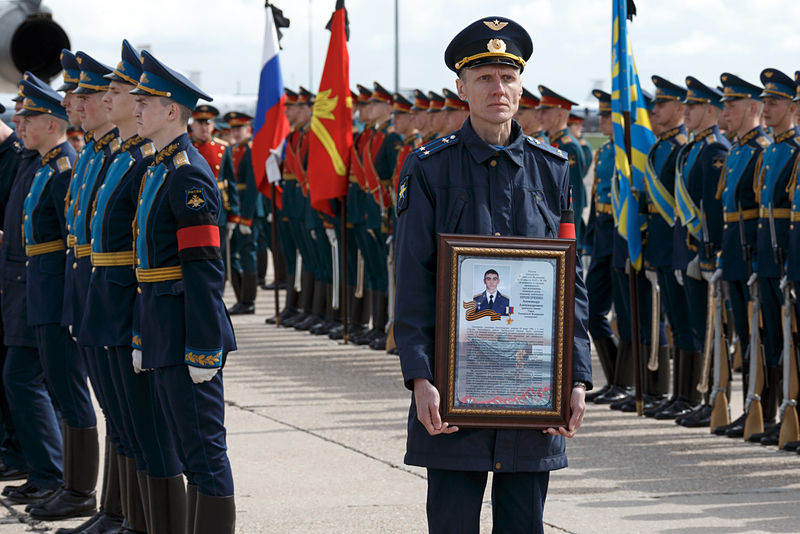 Prokhorenko was posthumously decorated with the Hero of the Russian Federation honor. He was buried in his native village, Gorodki, in the Orenburg Region. A Gazeta.ru source, who participated in the negotiations, said that it had been difficult coming to an agreement with ISIS and that the "negotiations" lasted for an entire month, from March 21 to April 21. In the end, Prokhorenko's body was exchanged for six ISIS captives. Since Kurds often take ISIS members prisoner, theoretically there exists the possibility of exchanging captives with the group. However, the jihadists rarely make contact, explained Farkhat Patiev, Chairman of the Council of the Federal National-Cultural Autonomy of Kurds. In Patiev's words, exception is made for militants who are of particular value to the Islamists: for example, if the captive is related to the families of ISIS leaders or is himself a commander. The Gazeta.ru source who was involved in the negotiations said that he could not relate the details of the exchange, since "there is an agreement between the Russian and the Syrian command to keep everything confidential." However, when asked if "Prokhorenko's body had indeed been exchanged for six ISIS militants," he replied that the Islamists "were given a great deal more." After Prokhorenko's remains were given to the Syrian Kurds, the YPG passed them on to the Russian command. For their operation the Kurds received a letter of gratitude from Russian Defense Minister Sergei Shoigu, noted the source. He remarked that the YPG had sent an official letter of condolences to the wife of the deceased officer. None of the sources spoke of any type of compensation from the Russian side. Official YPG representative Ridur Khalil declined to discuss the details of the exchange, stating that, "ours was a humanitarian operation and there is no reason to go into detail." A Gazeta.ru source from a group linked to the Jaish al-Muhajireen wal-Ansar terrorist organization remarked that negotiations with the militants initiated by Russia or Syria are conducted quite regularly. "From both the Russian and Syrian sides 2-3 representatives of the Syrian Mukhabarats [Bashar Assad's numerous Special Services] meet the militants. Moreover, they meet only with the amirs – defectors from the Syrian Army who in one way or another still have ties to the regime," explained the source. In his words, the negotiations are frequently held in a public place on Turkish territory, often a café. "The initiators, for example, ask that the military activities take place in a certain territory in which there will be no airstrikes. In exchange they offer vehicles, weapons and food."